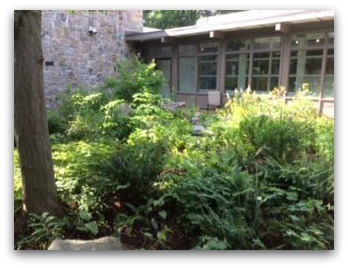 Like the perennial plants that bloom, then disappear there, the native garden in the Earthplace atrium has cycled through periods of growth and dormancy. Designed in 1960 by Eloise Ray — a noted landscape architect — at what was then called the Mid-Fairfield County Youth Museum, the handsome garden was filled with indigenous species. Eloise Ray, in the native garden she conceived and designed. 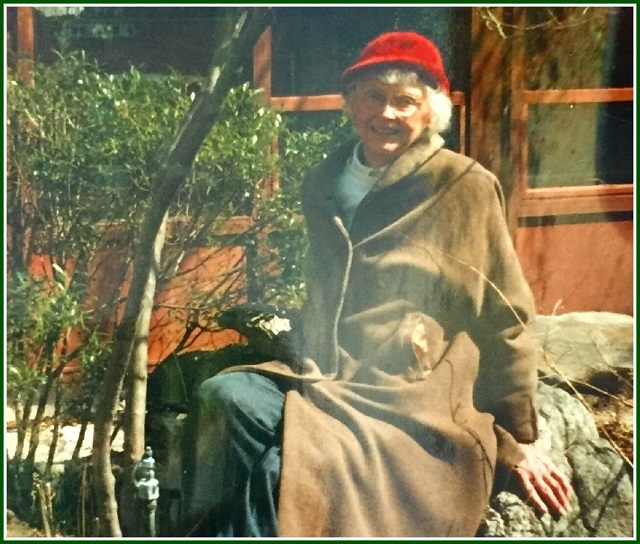 Over the years — as the name changed to the Nature Center — the garden became a favorite spot. A bronze statue and bench added to its serenity. In 1977, the Greens Farms Garden Club took over maintenance. They continued until 2011, when the board of trustees changed the courtyard focus. For a few years, the garden fell into disuse. But in the fall of 2015, the garden club revived it. They weeded vigorously. Working from Ray’s original blueprints, they planted 17 new shrubs, and 42 native plants. Last year, they added 12 more perennials. 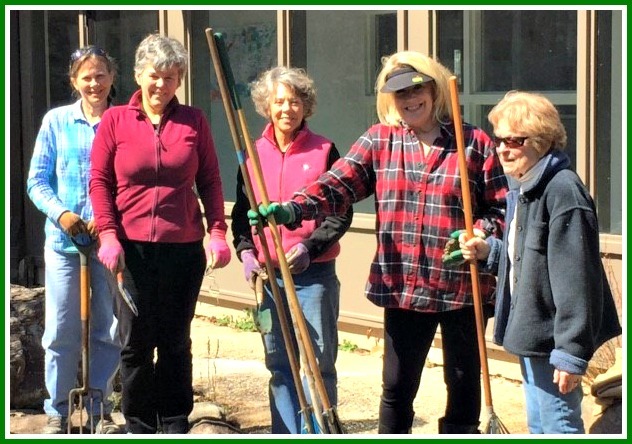 Greens Farms Garden Club members (from left) Ann Watkins, Barbara Harman, Wynn Herrmann, Rivers Teske and Donnie Nader take a rare break at Earthplace. Today the garden is once again a delight. It supports local wildlife like grey tree frogs. Honeybees pollinate the flora. Birds and butterflies abound. Earthplace’s atrium garden blooms again. On Saturday, March 11, guests will gather there for a Garden Party Gala. There’s great food and music, plus an auction. It’s a fundraiser for Earthplace’s education programs. Which makes perfect sense. Whether it’s flowers or the environmental awareness of children, Earthplace plants seeds, nurtures and grows. This entry was posted in Children, Environment, Organizations and tagged Earthplace, Eloise Ray, Greens Farms Garden Club, Wynn Herman. Bookmark the permalink. Beautiful garden! A must see at Earthplace!